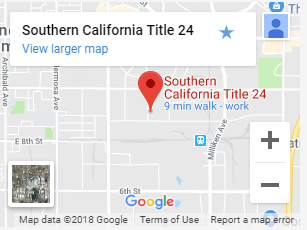 Why Do I need Title 24 Calculations? In 1978, the energy commission mandated legislation to reduce the amount of California's energy consumption. By implementing these standard California has reduced its energy cost by billions. The Title 24 report ensures your project is energy complaint. When will I need a Title 24 Calculations? It depends on the city/county you are working in and the extent of work being performed. 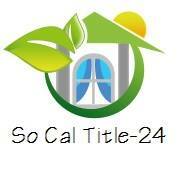 Typically on room additions, new construction, remodel, and window replacements it is required to submit Title 24 calculations with your plans. How much is it are the Title 24 Calculations? Which Title 24 do I need a 2008 or 2013, or 2016 Title 24? Click on the submit title 24 page to fill out the information needed for the project. We will also need a copy, mailed or digital, drawing of the site plan with north arrow, floor plan with window size and type, door size and type , and skylight size and location, HVAC plan showing type of heating systems and type of fuel, electrical plan with kitchen lighting, elevations, solar system and size (roof plan), and cross sections showing insulation values. If the project is an addition, I will also need to know all existing window sizes and type (wood, aluminum, vinyl, etc). Use the list below as a check list of thing you need to submit to perform a Title 24 Calculation. or click either link below to fill out the form online to submit for a Title 24 Calculations. How long does it take to prepare the Title 24 Calculations? Typically it take about 3-5 business days, once the report is completed it will be emailed. Same day rush service is $95, Overnight Mailings is $50 extra, and Standard First Class mail is $10. Typically we email report. If you would like to get the report in a 24 x 36 .pdf that is $20 extra to setup the page. What are your hours of business? What days are you closed? Drafting Room Additions and New Construction Plans. Custom Homes , Guest Houses and much more.